You probably have heard that once people cross the age of 30, they begin losing muscle & bone mass in increasing amounts. As we grow old, the changes in hormone structure & levels tend to pull in fat toward our mid section like a magnet. Unless you do something now, the belly fat will continue accumulating after 30 – and at a later stage it would become extremely hard to get rid of it. At 60, your body composition does not remain the same, as it was when you were 30 year old. Nevertheless, as for as exercise is concerned, the modus operandi to control belly fat involves the following – mostly the same practices as younger adults do. Read on here for the best exercise practices that will give you fast results in your endeavour to lose belly fat after 60. Don’t carry the wrong notion that by doing crunches or planks you can melt belly fat. While these exercises strengthen your core muscles, but actually they don’t burn much of the fat – what to say of the belly fat. Fat is fat, irrespective of wherever it’s placed on the body. To reduce it, we need to do exercises that burn calories. Our first goal should be to create a “calorie deficit” – meaning burning of more calories than what we’re eating. Sedentary Folks: For those seniors who currently are sedentary, they are likely to see positive results fairly soon by simply adding more physical activities to their daily routine. I recommend brisk walking, water games, swimming and cycling as some of the milder forms of exercise for the sedentary older people. Reason is that they all are low impact exercises and expected to cause less pain as compared to high-impact exercises like jogging. To start with do 15 minutes of exercise 2 or 3 days per week. Gradually increase time until you’re able to perform about 30 minutes of workout at a time, 5 days per week. And then you can increase the time further, frequency per week as well, and / or do more intensive forms of exercises. If Already An Exerciser – HIIT Fat Burner Is For You: For those who already are into regular exercising, but struggling to shed pounds from their mid section – they need to do more intense workout, that is a “Fat Burning Exercise Schedule: HIIT”. To lose abdominal fat, high-intensity interval training (HIIT) workouts are a must. 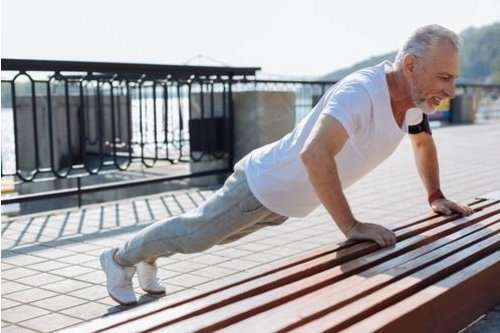 If you are over 60, we advise you to speak to your doctor before starting out any high-intensity interval training, in short known as “HIIT”- especially if you are on medication or having some conditions. HIIT is a technique of exercising, which involves doing workout by alternating between low/moderate intensity exercises and high intensity exercises. HIIT is better for fat loss, as well as to improve your metabolism. Select any type of cardio as per your choice, for example walking, cycling, swimming or using an elliptical trainer. Do a warm-up of 5 to 10 minutes then perform the selected exercise at higher intensity (for instance increased speed). After 30 seconds, reduce the intensity (slow down speed), and then go back to high intensity for another 30 seconds. Keep alternating for a total of 4 to 8 times, and at last perform a cool-down. As per the American Council on Exercise, HIIT is an excellent way to burn belly fat. Strength training is often dismissed by senior exercisers. But to control the increasing loss of bone mass & muscles, strength training is particularly essential as we grow old. Not only it strengthens muscles and helps in preventing falls, but the strength training does help burn higher amount of calories because muscles burn calories more effectively – so it can contribute a lot in creating caloric deficit, a key factor for shedding belly fat. A typical strength-training program can include free weights and/or machines, but it’s not always needed to do so. You can very well use your own body weight for doing squats, lunges, modified pushups, and pull-ups. For example, you can use a resistance band to do biceps curls, triceps extensions and shoulder exercises for the upper body. Aim to do 4 or 5 exercises for the upper body and 4 or 5 for the lower body just twice a week. To start with do one set of 10-12 repetitions for each exercise, and then add a second set after few weeks or months of training. As you gain strength, increase up to 3 sets for each exercise gradually and also increase the frequency per week. Read here for doing Strength Training Exercises At Home & Strength Training Exercises For Seniors. Whereas it’s a fact that abs exercises don’t spot reduce abdomen fat, but they nonetheless have an important role. The core, which embraces abdominal muscles among others, is the foundation of all physical movements. So a strong core means that you will be capable of performing the activities involved in the day-to-day living more safely & with much lesser risk of any injury. Aim to include core-strengthening exercises 2 to 3 days per week along with HIIT and other strength exercises. Previous articleCommon Pushup Mistakes – How To Correct Them: VIDEO!